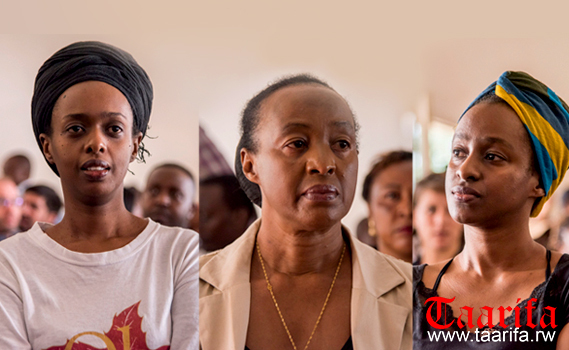 The court hearing of the Rwigaras has been adjourned to October 9 at 9am. This was announced by the presiding judge of the immediate court of Nyarugenge. The decision was taken after the trio claimed they were denied access to their lawyer, Celestin Buhuru. Buhuru met with his clients but did not get enough time to discuss in detail the substance of the charges and prepare his defence. He also had another hearing today. Clad in an old white round neck t-shirt printed on ‘Canada’ in a red maple leaf, black pants with high heels, Diane kept smiling in court as she chit chatted with her sister Anne. Their mother Adeline sat separately, and looked well dressed, and well groomed hair. She also wore jewelry and make up. Diane and Anne appeared unkempt. It seemed they had come from a different cell. As they exited the court room, Adeline turned and waved to the audience while holding a Bible. Earlier, the presiding judge asked suspects to decide on when they can appear in court again. They said they couldn’t make any decision in the absence of their lawyer. It was clear they had agreed their stand point before coming to court, but when they stood before the judge, they interrupted each other until the judge requested them to speak one after the other. The judge asked the prosecutor to respond to the suspects’ plea. He said it’s their right under Article 29 of the constitution. Prosecution said that nevertheless, the hearing was for the court to examine the grounds justifying provisional detention of the suspects.